Common brick – softer brick that is used on secondary elevation. Face brick – high fired brick that was used on a primary façade. It tends to be smoother and have a more even tone than common brick. 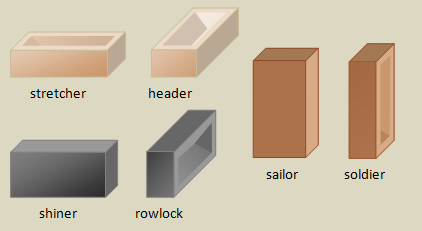 Extruded brick – brick that is created by running clay through a metal die of a set size or shape. The clay extrusion is then cut into individual brick-sized units. The brick is then allowed to thoroughly dry and then is fired in a kiln. Pressed brick – brick that is hand pressed into individual molds and allowed to dry before being fired in a kiln. Pressed brick is often identified by a slightly wavy pattern on the brick face caused when different layers of clay are hand-pressed together. Hollow brick – hollow brick, also known as perforated brick, contains holes called “cells” within the body of the brick. The cells reduce the weight of the brick, making hollow brick cheaper to manufacture and cheaper to transport than solid brick. The number of cells varies depending on the manufacturer, though two, three, six, and twelve cells are the most common. Standard brick – a term regulated by the American Society for Testing and Materials (ASTM) for bricks that are 8 inches x 3 5/8 inches x 2 1/4 inches. A misnomer, Standard brick is no longer the industry standard. Modular brick – a term regulated by the American Society for Testing and Materials (ASTM) for bricks that are 7 5/8 inches x 3 5/8 inches x 2 1/4 inches. Modular bricks, along with a typical 3/8-inch of mortar, provide the standard 8-inch module that is the current industry standard. Roman brick – brick that are longer and flatter than standard and modular brick. The name derives from the traditional long and flat bricks fabricated by the ancient Romans. Clinker brick – brick that has been burnt, or vitrified, in the kiln. Clinker bricks are very dark and are misshapen. Traditionally, they were discarded, but it became fashionable to use clinker bricks as decorative features in the early twentieth century. Glazed brick – brick that has a glaze applied to it prior to firing. It has an impervious finish and can be found in many colors. Flashed brick – brick whose surface has dark or colored block patterns caused by varying the temperatures or conditions within a kiln during firing. Iron-spot brick – brick whose surface is speckled with dark spots. A misnomer, the “iron” spots are created by the application of various metals, such as manganese, to the face of the brick before firing. The spots can range from the size of pin points to the size of pencil erasers. Wire-cut brick – brick that has a slightly rough surface texture caused when a wire is run through soft clay. The texture of the drag marks on the face of the brick follows the direction of the wire movement. Frog – A frog is an indented manufacturer’s stamp that is usually on the long, wide side of the brick. It is usually hidden inside a brick wall, covered by mortar. Headers – brick installed with the short end (the width) of the brick facing out, parallel to the ground. Stretchers – brick installed with the long, narrow side of the brick facing out, parallel to the ground. Soldiers – brick installed with the long, narrow side of the brick facing out, perpendicular to the ground. Rowlock bricks – brick installed with the short end (the width) of the brick facing out, perpendicular to the ground. Shiners – brick installed with the long, wide side of the brick facing out, parallel to the ground. Sailors – brick installed with the long, wide side of the brick facing out, perpendicular to the ground. 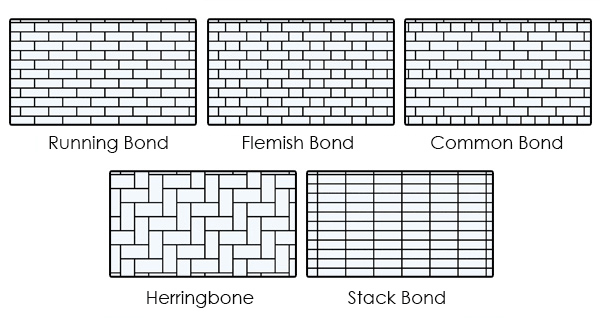 Common bond – also known as American bond, common bond brick work is installed with five to seven courses of stretcher bricks for every course of header bricks. 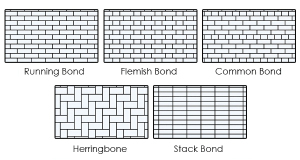 Flemish bond – brick that is installed in alternating headers and stretchers. At each course, the header is centered above a stretcher. Herringbone pattern – brick that is installed with either stretchers or shiners oriented in a zig-zag pattern. Running bond – brick that is installed entirely with stretchers, devoid of headers that tie the face brick to the backup brick. Each course of stretcher is staggered so that the joints do not create straight vertical lines. Stack brick – brick that is installed entirely with stretchers, with each course of bricks stacked atop the next. This creates a pattern of straight vertical joints. Corbelled brick – brick that is installed in an inverted stepped pattern with the upper brick projecting more than the lower brick. Corbelled brick usually creates a cornice, or it may visually supports a cornice, a bay window, or other projection. Diaper pattern – brick that is installed in a diamond pattern with header bricks creating the outline of the diamond. The header bricks may project from the surface of the wall, or they may be different color bricks. Igneous – stone that is produced when volcanic activity, either above or below ground, creates magma or ash. When the magma and ash cools, igneous stone is formed. Igneous building stones include granite and rhyolite. Sedimentary – stone that is produced by the deposit of sediment in a body of water. The sediments are cemented together when the body of water dries out, and the sediments are heated and compressed by the earth. Sedimentary building stones include sandstone and limestone. Metamorphic – stone that is produced when the Earth heats, twists and compresses existing stones. Metamorphic stones may be created from igneous stones, sedimentary stones, or the heating, twisting and compression of other metamorphic stones. Metamorphic building stones include marble and slate. Granite – an igneous stone that is coarse grained. It often contains orthoclase, feldspar and quartz. Limestone – a sedimentary stone that is fine grained. It is made primarily of calcium carbonate, and may contain calcium-based fossils such as shells. Marble – a metamorphic stone that can range from fine to coarse grained. It is metamorphosed limestone, so it is made primarily of calcium carbonate, though it may also contain dolomite. Rhyolite – also known as tufa or tuff, rhyolite is an igneous stone that is fine grained. It is created when hot volcanic ash settles and is rapidly compressed. It typically contains fine air bubbles. Sandstone – a sedimentary stone that is fine grained. It is made when quartz from a riverbed or seabed is compressed into stone of many centuries. Sandstones may be named by their color: for example, bluestone is blue sandstone, and brownstone is brown sandstone. Slate – a metamorphic stone that is fine grained. It is metamorphosed shale, and has characteristic cleavage along parallel planes (sometimes called ‘slatey cleavage’). Travertine – a sedimentary stone that is made of calcium carbonate deposited by mineral springs. It is a type of limestone, and its characteristic large pores are formed when algae and other bacteria get trapped while the calcium carbonate is deposited. Inclusions – a mineral deposit or a fossil that is trapped when a stone is formed. Iron inclusions may cause surface rusting of a stone, while fossil inclusions provide visual variety to a stone. Ashlar stone – stone that is cut with straight edges on all sides with a smooth or lightly-textured tooled face. Dimension stone – any cut and shaped stone that is used on a building, structure or object. Rubble – broken pieces of stone that are not shaped or cut before installing in a wall. Rubble is usually used in basements to build non-visible foundation walls, or it may be used as a garden or retaining wall. Veneer – thin pieces of stone that are applied to a steel frame or a masonry backup wall. They are not load bearing and are usually attached to the backup wall with clips. This is a modern, twentieth century masonry technique. Rusticated stone – sometimes called rock-faced stone, rusticated stone has smooth cut edges like ashlar stone, but has a rough surface on the outside face. It is often used on a building’s base or foundation, but may be used anywhere on a building. 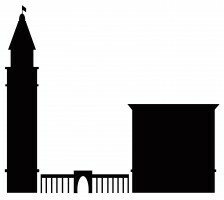 You can find an excellent visual glossary of stone tooling techniques here. Arris – a sharp edge where two stones meet. Chamfer – an angled edge of a piece of stone (or other material) that does not equal 90 degrees. Fluting – the vertical, concave grooves cut into the shaft of a column. Margin – a border, about an inch or so from the edge of the stone, that is tooled differently from the stone’s face. It is often tooled with striations perpendicular to its edge. Bisque – the hard clay body of the terra cotta. For architectural terra cotta, the bisque is usually covered by the glaze, though it may become visible if any portion of the glaze spalls. Slip-glazed terra cotta – this is the first type of terra cotta manufactured in the United States. It was popular between about 1870 and about 1890, though it was often found in Denver on buildings built until about 1900. Slip is a mixture of clay and other materials that is suspended in a liquid, such as water. It is the soft, smooth pigmented liquid that forms when clay is worked. Slip was applied to the clay bisque of terra cotta, and then fired to create a hard surface coating. Slips can be a range of colors. Because terra cotta was originally developed as an alternative to natural building stone, slip-glazed terra cotta is red or orange-red to match red sandstone. Slip-glazed terra cotta was usually load-bearing masonry. Glazed terra cotta – glazed terra cotta came into fashion in the 1890s, or about 1900 in Denver. Glazes are made using silica, metal oxides, alumina, and pigments that are mixed together. They are applied to the clay bisque of the terra cotta, which is fired. The glaze forms a strong, glossy, vitreous coating on the outside of the terra cotta unit. Glazes may come in any number of colors, but common colors of glazed architectural terra cotta include buff (white), beige, and red or red-orange to match marble, limestone, buff sandstone and red sandstone. Glazed terra cotta was usually not a load-bearing material. Instead, it was installed using unique hanging systems developed for terra cotta construction. Hollow clay tile – also known as structural clay tile, hollow clay tile is porous, unglazed terra cotta that was created in regular shapes and sizes. In the 1890s and first half of the twentieth century, it was used to build walls and floor systems, and often encased structural steel columns to act as a fireproofing material. Because it is not durable when exposed to the elements, it was either covered with plaster or stucco. Hollow clay tile was supplanted in the 1940s by concrete blocks (cinder blocks) as the preferred, structural material used on the interior of buildings. Hanging system – glazed terra cotta was installed on a building using a unique hanging system of J-hooks, angles and other hooks attached to structural steel beams. The hanging system was usually made of iron. Over time, moisture infiltration into the building caused the iron hanging systems to corrode, resulting in cracks, displacement and failure of the glazed terra cotta. Concrete – a mixture of a binder (cement), aggregate (sand and gravel), and water. Concrete may also contain pigments to provide color, or admixtures that may improve the concrete’s strength or hardness, the speed at which it hardens, or the temperature at which it hardens, amongst other things. Concrete best hardens and cures under conditions of high humidity, which is why you often see construction workers using sprinklers on a new concrete highway. Poured-in-place concrete – concrete that is poured into formwork molds on a construction site. Poured-in-place concrete is monolithic, though it may be poured with expansion joints. Poured-in-place concrete always contains steel reinforcing bar (rebar) to provide tensile strength to the concrete. Cast stone – sometimes called precast concrete, cast stone is concrete that has been cast into individual units in a factory before it is shipped to a construction site. Some cast stone units contains steel reinforcing bar (rebar) to improve the concrete’s tensile strength or to provide structural reinforcement. Concrete block – sometimes referred to as cinder block, and known in the building trades as concrete masonry unit (cmu), concrete block is made of concrete cast into standard-sized blocks containing cells. They can be used for load-bearing walls or foundations. Although they began to be used in the late nineteenth century, they were not commonly used until the 1940s. Cement – Portland cement is used as the binder in concrete construction. It was invented in the early 1800s in England by Joseph Aspdin, who named it after Portland stone due to dried Portland cement’s strong resemblance to that natural stone. It was not manufactured in the United States until the 1870s. Aggregate – the aggregate used in concrete includes fine aggregate – sand – an coarse aggregate – gravel. Other aggregate such as crushed, recycled concrete may also be used as an aggregate for new concrete. Admixtures – chemical additives that may improve the concrete’s strength or hardness, the speed at which it hardens, or the temperature at which it hardens, amongst other things. These may include: air entrainers, which increase durability as they weaken the effects of freeze-thaw cycling; accelerators or retarders to speed up or slow down the hardening of the concrete; an plasticizers, which reduce the amount of water required while maintaining the workability of the concrete. Rebar – also known as reinforcing bar, rebar is often made of steel and is used to improve the tensile strength of concrete. Formwork – wood molds used to determine the size and shape of poured-in-place concrete on a construction site. Formwork is usually made of plywood, but any size or type of wood may be used to impart grain and texture to poured concrete.